Hello Readers! Greetings from Denver, and apologies for the long silence on this blog from me. If you were wondering whether I’d lost interest in Usher syndrome, quite the contrary! I’ve been neck-deep in some very exciting research over the past year, some of which I’ll be presenting here this week, and just haven’t had the bandwidth to science blog very much. Mark and I are putting out heads together about new content for the blog over the next months, so watch for more regular contributions from both of us. Meanwhile—I’m at ARVO! And it’s just as wonderful and stimulating and overwhelming as it always is. 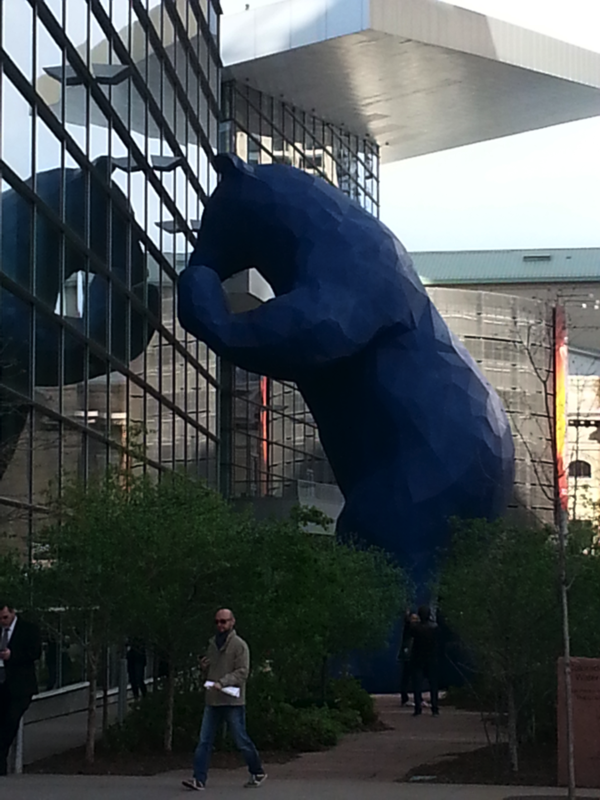 The 40-foot-tall Blue Bear sculpture (most appropriately entitled: “I See What You Mean”) peeking in the window perfectly exemplifies the awe and curiosity that this meeting can evoke. The very first talk session (“Gene Editing: From Cells to Eye Disease”) got off to a hot start with Dr. Ed Stone, giving a brief overview of some current methods to alter/repair the genetic information in cell cultures, and then showing some promising results using cells derived from RP patients, including one with USH2A. A few years ago, being able to culture uncommitted stem cells into retinal cell types was big news. Next came the breakthrough of being able to obtain stem cells by taking skin cells and inducing them to become stem and then become retina. The next link in the chain has been, given a dish of cells induced to become retina from a patient with retinal disease, figuring out ways to edit the molecular information in those cells and repair the genetic defect they harbor. Currently there are several different methods for tinkering with the genetic code of a cell. Imagine if the heating system in your home was broken. One option would be to bring in space heaters to compensate for the defect. The other solution would be to actually fix the heating system. Similarly, whereas traditional gene therapies (like the ongoing UshStat trial for USH1B) focus on delivering an externally-derived supply of ‘good’ information to compensate for the faulty information in a patient’s DNA, the newer approach is to repair the source of the bad code. For some types of mutations, this is being attempted by editing the DNA and effectively rewriting the code (or splicing in better code) to fix the problem—replacing a faulty circuit in the heater, if you will. In other cases, the strategy is to bypass the problem by tricking the molecular machinery into working around it—more like putting in a splitter so that the faulty circuit can be bypassed. (For those of you who’d like more detail on these methods, I’m planning a longer blog post after ARVO outlining the different options, their strengths, limitations, and applications to Usher syndrome). Note that I don’t mean to imply that one method is necessarily ‘better’ than the other—what might be the best choice in one situation wouldn’t work so well in other cases, and this decision is going to depend on the nature of mutation and many other clinical factors. Bottom line: it’s good to have options. The next step will be to develop ways to either achieve the same type of repair by delivering the editing mechanism into the patient’s eyes, or by implanting repaired cells into the eye. That step isn’t here yet, but now that the scientific pioneers have shown us the way, lots of other labs are working on the problem. I heard a lot of great talks today reporting on research from new labs jumping into the game, trying these gene editing treatments in animal models or various human cell cultures. The days of peeking through the window and observing things happen are growing shorter. Soon, we’ll be able to enter the building and start making changes. Questions? Comments? I’d love to hear from you, Usher community. I’m also tweeting from the meeting under the Usher Coalition Twitter handle every day, so feel free to reach out to us there, as well. Signing off from the Mile High City. Much more to come tomorrow!